The purpose of this page is to discuss strokes that are associated with dizziness or hearing disturbances. 800,000 strokes occur every year in the US. It is estimated that about 80% are preventable. Ischemic strokes are caused by blockage of blood vessels. The blocks may originate from a distant source -- such as a clot from the heart -- then they are called "emboli". The blocks may result from clotting from within - -then they are called "thrombi". Thrombotic strokes are most often attributed to buildup of cholesterol within blood vessel walls, producing a turbulence and roughening of the wall, onto which a clot forms. Another common cause of thrombotic stroke is a sustained drop in blood pressure -- such as might be due to a cardiac arrest for several minutes. There are just occasional sources of ischemic stroke outside these general two categories (emboli and thrombi). For example, strokes can be caused by mechanical obstruction of blood vessels - -which might happen during a high speed chiropractic manipulation of the neck, or some other event that causes a very forceful neck movement. We have encountered patients who have experienced stroke (as an example), after roller coaster rides. Hemorrhagic strokes -- are about 15% of all strokes. They consist of leakage of blood within the brain - -are most commonly caused by too high blood pressure. Other possible causes include irregularities in blood clotting, damage to blood vessel walls by various processes (including ischemic stroke), and and vascular malformations such as aneurysms or arteriovenous malformations (AVM). In the brainstem, circuitry is tight and hemorrhagic strokes are often deadly or devastating. CTA reconstruction of a normal anterior circulatioin showing the carotids. 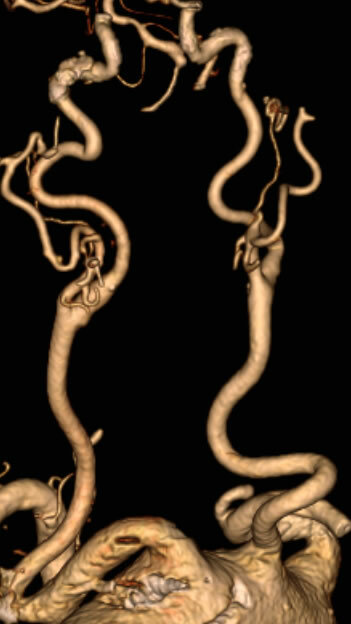 Carotid Occlusion (see picture above). Carotid disease rarely causes vertigo. This is because the parts of the brain that control motion perception are in the back, and are supplied by different arteries (the vertebral and basilar arteries). When carotid disease is severe, and accompanied by disease in the posterior circulation, carotid disease can be associated with vertigo, but this is unusual. Diagnosis is via MRA, CTA, doppler, or angiography. Strokes in the middle cerebral artery territory are common, but they rarely cause dizziness. Strokes in the anterior cerebral artery territory are uncommon, but again they rarely cause dizziness. 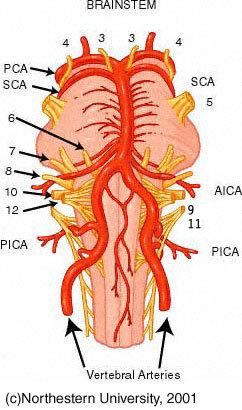 The posterior circulation supplies the brainstem and the back of the brain (mainly occipital cortex). The symptoms in posterior circulation strokes are usually mainly due to the brainstem, as the neural pathways are much more tightly packed and also control many more bodily functions than the back of the brain. The occipital cortex mainly processes vision. Brainstem Strokes are uncommon, but they are frequently accompanied by dizziness. They typically are strokes due to occlusion of the vertebral or basilar arteries (see figure on right). See this page for more about brainstem strokes. Detecting that dizziness is due to a stroke. The huge majority of persons with dizziness are not having strokes. Most of the time dizziness is due to the inner ear, a medical issue, or perhaps a migraine. On the other hand, strokes are dangerous and it is desirable to separate out those having stroke induced dizziness for specialized treatment. Recently there has been effort made to develop tools for emergency room doctors to screen for strokes in dizzy patients. These efforts generally rely on algorithms designed to identify persons with high risk for stroke, such as the "ABCD2" score, and recently the "HINTS" score has been suggested to be even more effective. The ABCD2 score is based on age, Blood pressure, Clinical features, and Diabetes. (Asimos et al, 2010). D - 1 point for Diabetes. Thus the ABCD score is just clinical judgment, and uses no data concerning the type of dizziness. A positive HIT test (against stroke), lack of unidirectional nystagmus (against stroke), and skew deviation (for stroke). Again, it is just clinical judgment, but requiring more neurological skills -- as the examiner must know how to identify a positive HIT test, as well as horizontal nystagmus and skew. Treatment of strokes involving dizziness -- see this page. Asimos, A. W., et al. (2010). "A multicenter evaluation of the ABCD2 score's accuracy for predicting early ischemic stroke in admitted patients with transient ischemic attack." Ann Emerg Med 55(2): 201-210 e205. Kattah, J. C., et al. (2009). "HINTS to diagnose stroke in the acute vestibular syndrome: three-step bedside oculomotor examination more sensitive than early MRI diffusion-weighted imaging." Stroke 40(11): 3504-3510. Kerber, K. A., et al. (2015). "Stroke risk stratification in acute dizziness presentations: A prospective imaging-based study." Neurology 85(21): 1869-1878.